A witty and topical play, which explores our obsession with celebrity status and the ordinary person who desperately tries to get their 15 minutes of fame. The play also demonstrates how celebrity status can be lost as quickly as it is obtained and how ruthless and fickle the media can be. However, one man?s downfall inevitably leads to someone elses gain. Alan Ayckbourn?s recent play reflects our obsession with celebrity culture today. DROWNING On Dry Land?is full of characters you wouldn?t cross the road to avoid - you?d cross a continent. They really are a horrible bunch and when the leading man falls off his celebrity perch you greet his demise with a mere shrug of the shoulders. It?s almost as if they?re engaged in some sort of contest to see who can be the most objectionable, from the gushing, back stabbing TV personality Gale Gilchrist to the hard faced Linzi Ellison. While I wouldn?t describe the piece as vintage Alan Ayckbourn - the ending is particularly weak - there are some great lines and priceless scenarios to enjoy. He?s a clever beggar, that Ayckbourn. Altrincham Garrick?s latest production features a strong ensemble cast and the pick of the performances come from Simon Royce as the famous failure Charlie Conrad, Kathryn Worthington as the horrendous Gale Gilchrist and Natalie Horne as the mousy children?s entertainer Marsha Bates. Her poor face was a picture as Conrad?s smug and smarmy lawyer Hugo de Prescourt tied her up in knots over her allegation against Conrad, a man with all the personality of a tailor?s dummy. Ms Horne consistently impresses me whenever I see her at the Garrick and this is a beautifully pitched piece of character acting. In an age in which non entities become celebrities after winning lame brained reality TV shows,?Drowning On Dry Land?couldn?t be any more topical. While it isn?t in the same league as Ayckbourn classics like?Woman In Mind?or?Absurd Person Singular, this play is hugely enjoyable and highly entertaining and I couldn?t resist a satisfied smile when Conrad?s world collapses around him. God forbid anything like that should happen to Jade Goody. HOW often has a child responded to the question "What do you want to be?" with the answer, "I want to be famous". This surely stems from the current penchant for reality TV and the worship of celebrities. How many "stars" can you think of who aren?t particularly good? 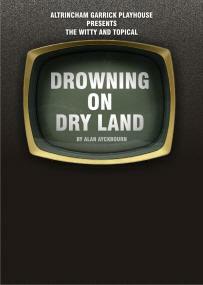 In his 66th play,?Drowning on Dry Land, Alan Ayckbourn places his magnifying glass on this aspect of modern life. He does it through a character called Charlie Conrad who becomes famous by accident because he is no good at anything. Like all those who go up, he has only one way to go ? and that is down, despite and, possibly because of, his agent (David Beddy) and media people who egg him on, not least of them, Gale Gilchrist (Kathryn Worthington). The irony is that his wife, Linzi, a TV presenter, is good at what she does but doesn?t receive the same acclaim. Needless to say with a subject like Charlie who is as dim as they come, the play has the audience rocking with laughter. Not only is the dialogue funny but it also contains plenty of down to earth slapstick comedy. Most of this comes from a clown the couple hire to entertain their children. She has a crush on Charlie but when she asks for his autograph, all hell is let loose ? and it is not the clown who takes the tumble! Natalie Horne switches well from shy Marsha to confident Mr Chortles, the clown. The play is set in a folly ? well contrived by Juliet Jones ? and that, has a hidden message in its staircase which never goes to the top, but ends where it began. The irony is obvious. The Garrick are lucky to have a large number of talented people who can successfully take on lead parts. In this play we have Simon Royce who brings the not very bright Arthur to life and Beverley Stuart-Cole who turns his wife, Linzi, into something akin to Victoria Beckham. But what stands out about the Barrington Road theatre is that those who take on smaller parts are consistently good, too. In this case, I liked Martin Oldfield?s Hugo, who captures the clipped formality and stance of a lawyer who rescues Charlie when he is caught in flagrante with his children?s entertainer in front of a journalist. The usual Garrick professionalism prevails and there is just the tiniest twist at the end.